Braids are a very popular styling option for African American hair. Especially during the warmer months of spring and summer. 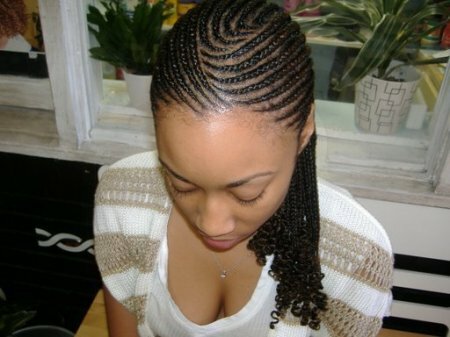 They are also a great style for those transitioning from relaxed to natural hair. For the most part they are low maintenance, they can be worn in various ways and can be a great way to protect your hair as you try and get it in better/healthier shape. In order to get the benefits of keeping your hair braided, make sure you do what it takes to keep your braided hair healthy. If you get your hair relaxed make sure you wait 3-4 weeks to get your hair braided; relaxers weaken the hair and the stress of braiding can cause it to break off at the root. Itchy, flaky and dry scalp are common amongst African American women. Our hair requires a proper amount of moisture. By using a braid spray or lightweight oils such as Jojoba or Sweet Almond every 3-4 days, you can keep your scalp healthy and moisturized. Make sure you only wear your Braids 6-8 weeks. If your braids are put in too tight it can cause alopecia, which is a serious condition that causes hair loss and possible baldness. So make sure the stylist that puts them in doesn’t do them so tightly that it causes tension or pain on your scalp. If you have any split ends, trim your hair after taking your braids down. African American hair needs to be washed every week or two; to protect your braids use a stocking cap when shampooing. Sleep on a silk or satin pillowcase or with a satin bonnet or scarf to protect the moisture in your hair and prevent lint buildup; cotton can absorb oils from African American hair, leaving the your hair brittle and dry. So far my favorite brand for loc extensions or braids work is the Vivica Foxx line or Beverly Johnson. I’m happy that you are enjoying the site ! Thanks for sharing your expertise on natural hair care. I was wondering could you suggest your preference of the type and/or brand of hair that should be used for braids? what this website is providing. Keep up the good work! Hello Angela, If you feel like braids may be too harsh for your hair i would recommend trying two strand twist. Either way make sure that whoever does them doesn’t do them too tight so that you don’t have any more damage. Thanks for sharing this info. I’m glad to hear there are some lighter oils that I could use on my hair. Also, I have been wanting to get my hair braided. Right now I am growing my natural and just wondering if I dare get braids. My hair is a lot thinner at the nape because I use to wear brades alot, many years ago and they may have been too tight at times. Any suggestions for anything other than braids or any particular STYLE of braiding you can recommend?